I love innovative companies that are keen to discover new ways to solve problems. If you look at most trail socks on the market, they all focus on using different material blends and types of compression, but none have really given any thought to the actual design. That is what attracted me to Injinji, the pioneer in performance toe socks, in the first place. They looked at the typical sock, said ‘we can do this better’, and turned the traditional design on its head. I met the CEO of Injinji at Outdoor Retailer this year and got to chat a bit about their product approach. 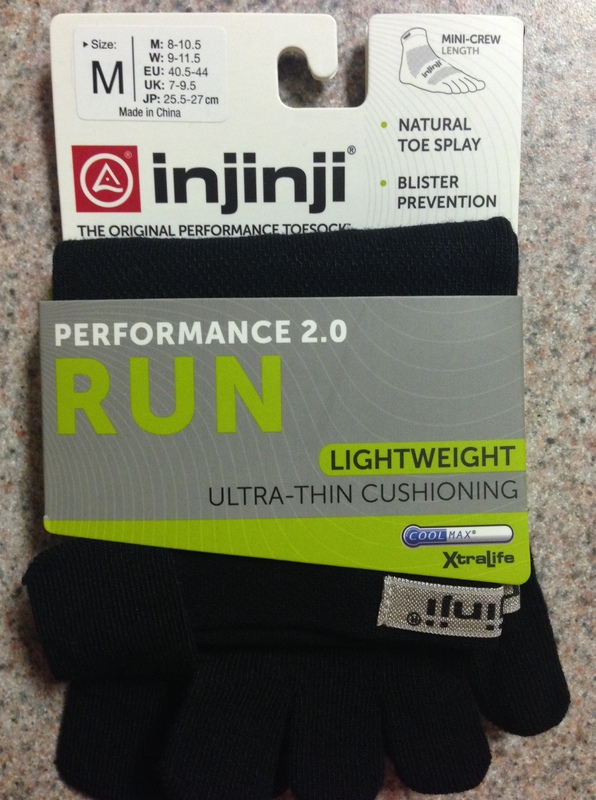 After discussing how, after going back and forth between a half dozen brands I have started to gravitate toward Injinji over the past few months, he asked me if I would be interested in reviewing some of their newer line of products. Disclaimer: Injinji provided me with the socks I am reviewing in this article to support my review. As always, this does not influence my personal beliefs and what I have outlined in the review. As I am reviewing three of their product lines, I debated breaking it up over multiple post, but this approach offers a better comparison. Injinji has one of the broadest lines of socks out there, with something designed for every type of person, from performance to everyday wear. As you can see in the image below (Source: Injinji.com), Injinji performance socks focus on three main tenets: Total Foot Utilization, Moisture Management, and Blister Prevention. Within their performance-based lines, Injinji offers various different versions based on a combination of style, weight, and cut. The chart below highlights the combinations and calls out the versions that are included in this review. The Run 2.0 sock is geared toward road running. It is the thinnest of the three styles i reviewed and is designed to be light while also reducing friction and sweat build up. Since running on the road doesn’t have the same demands as trail, this style favors a lighter, more breathable sock that disappears on your foot versus a thicker, more padded sock. The Trail 2.0 sock builds on the run sock, but incorporates some changes based on the demands of running on trail terrain. It incorporates more padding and better moisture management, helping to keep water away from your feet for a prolonged time. It also incorporates a mesh upper so that you don’t have to sacrifice breathability. The Outdoor 2.0 sock is the sturdiest of the three styles I reviewed and seems to be geared more toward less fast-paced activities, such as hiking or normal outdoor wear, where comfort and warmth are often emphasized. It uses a different blend of merino wool than the other lines and only comes in higher cuts, such as crew and mini-crew. Injinji offers three weights, light, original, and mid. As you would expect, these weights are very closely tied to the style of sock you are wearing. For example, the light weight is only available in the Run 2.0 whereas the Trail 2.0 is only available in mid weight. The driver here seems to be the intended use of the sock. The more gnarly the terrain, the more padding you will need. Injinji offers different types of cuts, which like weight, are tied to the style. The cuts include no-show, micro, mini-crew, and crew. No-show is only available in the Run 2.0 whereas crew is only available in the Outdoor 2.0. I have found cut to be very much a personal preference thing. As I run on trails a lot, I generally like the micro or mini-crew cut for the protecting it provides my ankles against cuts/scratches. My wife on the other hand tends to prefer the no-show. I guess it all depends on your taste. As I am predominately a trail runner, my review will emphasize running on trail terrain, however, there will be a few exceptions. The no-show socks I tested on the road because I do not like no-show on socks on the trails due to their lack of ankle protection from branches, sharp objects, etc. The crew cut socks I tested on a hike because I do not care for high cut socks while running. I found both of these exceptions to be acceptable because I had alternative cut socks with the same style/weight to test on the trails. It also gave me a chance to test out their products in some other capacity. I also did my best to run on similar terrain and in the same model shoes (on the trails) so that I could provide a reasonable comparison between the various sock types. Lastly, I ignored the sock cut during my review because it had little impact on performance. As a result, we will see four main sub-categories. Now, enough of the rambling and on to my review! On the road, these worked extremely well, particularly if you like a thin sock that is breathable and barely noticeable. Coincidentally, it rained a lot during my run while testing these so I got some solid water testing in as well. They handled quite well when wet. I typically worry about two things when it comes to wet socks, the sock stretching and changing shape as well as how waterlogged they feel. They passed the test in both categories and seemed to handle water remarkably well overall. The one complaint I had is that the sock was so thin that my foot didn’t feel as snug in my shoes. This is likely a factor of the road shoes I wear combined with my personal preference for a thicker sock, but I will mark down the score a bit based on this (although others might actually prefer it). On the trail, these would work wonderfully for people that like a thin, nimble sock. Unfortunately, that is not me at all. They felt great initially and will work great for a quick after-work run, but I felt my feet asking for a more cushioned sock after about ten miles. Ideal Use: Non-technical, speedy shorter trail runs or anything on pavement. Great for someone that prefers a snug shoe and doesn’t have a ton of room inside for a cushioned sock. I must say, even though not specifically designed as a trail sock, these performed quite nicely on the trail and could be considered fairly comparable to the Trail 2.0. The added cushioning was a nice step up from the light weight version without sacrificing breathability. They were super comfortable, but still a bit less padded than the Trail 2.0, which is something I definitely noticed on technical, rocky trail. Still, for a less demanding trail surface, I might give these the advantage. At the end of the day, using these versus the Trail 2.0 will depend on the technical nature of the trail you are using and what you need more, breathability (Run 2.0) or protection (Trail 2.0). As you may expect from a trail runner, these are my go to style on most of my runs, but especially on longer runs. I prefer a thicker sock on the trail and these provide the perfect balance of cushion and protection without feeling too bulky. The added padding that comes with this model provides ample cushioning over the long haul. While I would probably change them out for a fresh pair after 50 miles just to get a fresh pair on, I have no doubt that if changing socks wasn’t an option that they would hold up well beyond that. In terms of hot spots, I personally have three problem areas: back of the heel, big toe, and the inside of the ball of my foot The one that typically bugs me the most is on the big toe, and I feel that I have the individual toe sock design of the Injinji socks to thank as the reason why I no longer have to deal with this issue. I still occasionally have some minor irritation on the ball of my foot, but it hasn’t yet escalated to a major issue with these socks on (as it is not regular, it may be a shoe issue). In terms of temperature, they keep my feet cooler, especially compared to other trail socks. I have had to run through water with these socks on and have had no issues with the Trail 2.0 in these conditions either; they manage damp conditions really well. Ideal Use: Any trail surface and any distance, although this style separates itself from the thicker version of the Run 2.0 as the distance increases. Initially, the Outdoor 2.0 seemed to lean more toward a hiking use, but as promised, I took them for a spin for some mountain running. These shoes were quite cushioned, maybe more than any other style, definitely catering to a long day on your feet. 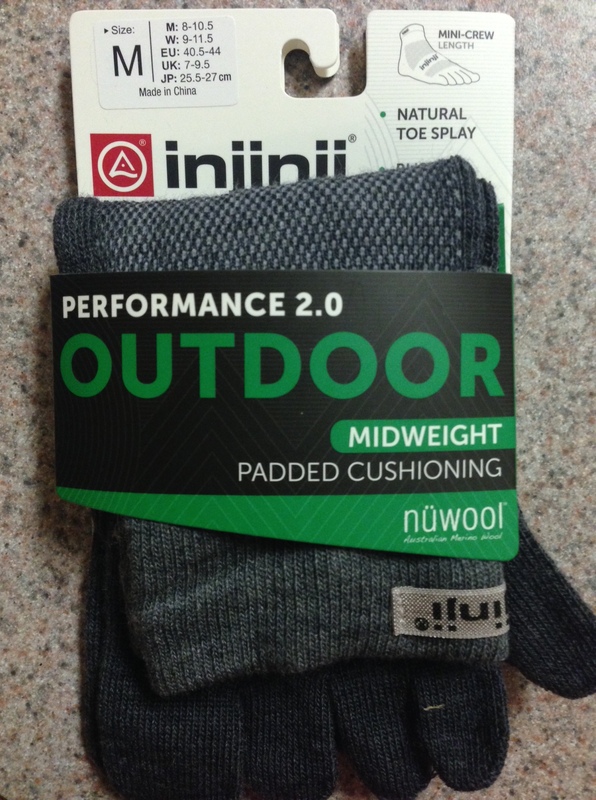 These use a different material (Injinji’s nuWool), which gave them a softer feel, but also meant that they kept my feet warmer. On a cool and wet run, they kept my feet dry, but they were also warmer than I typically like. For that reason, I will likely stick with the Trail 2.0 until winter rolls around, where I see these coming in extremely handy. I did find these to be comfortable wearing as an everyday sock too! Ideal Use: Long hikes or winter trail running. Everyday wear. I won’t lie, it took me some time to get used to the feel of toe socks, but as I said earlier, once I did I started to gravitate toward using these socks more frequently than all other brands combined. They even passed the wash test, in other words, they held up nicely after going through the laundry. I am very encouraged by Injinji and even if you disagree with my specific assessment, the product selection that they have brought to market is sure to offer something for every type of runner. As I said, I wrote my review from the perspective of a trail runner. Some of these socks are designed more toward road use than on the trail and excel quite well in the terrain they were designed for, but since trail runners are my audience, the scores will be weighted as such. *Remember, these scores are based on my perspective as a trail runner. In the end, there is not much I can say against Injini. 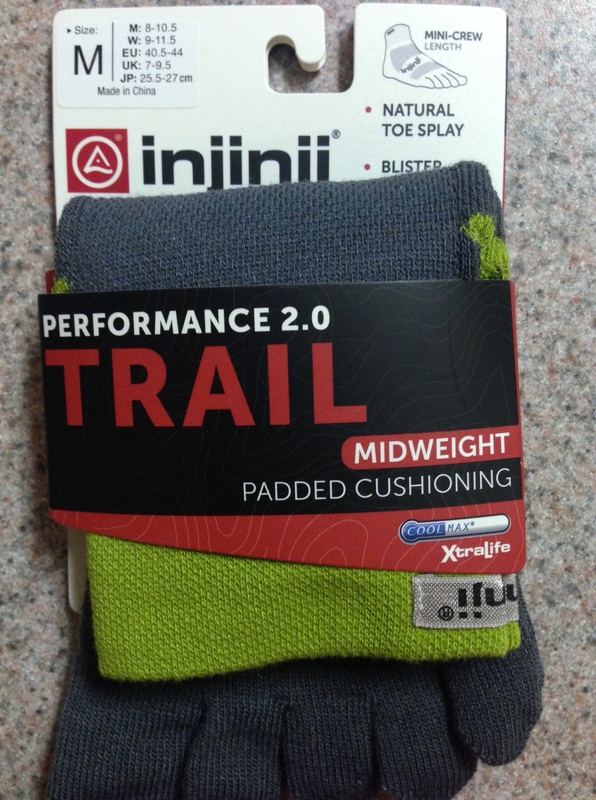 I am sure I will continue to get free socks in the future (a common race bag giveaway), but I will likely reserve those for other uses as I rely on my Injinji’s when I hit the trails. If you liked this review, then follow my blog at ultrarunnerjoe.com for notifications on all of my latest posts. This entry was posted in Gear Reviews, Product Spotlight, Uncategorized and tagged Accessories, footwear, Injinji, running, socks, trail running, ultra running, ultrarunning by Ultrarunner Joe. Bookmark the permalink.